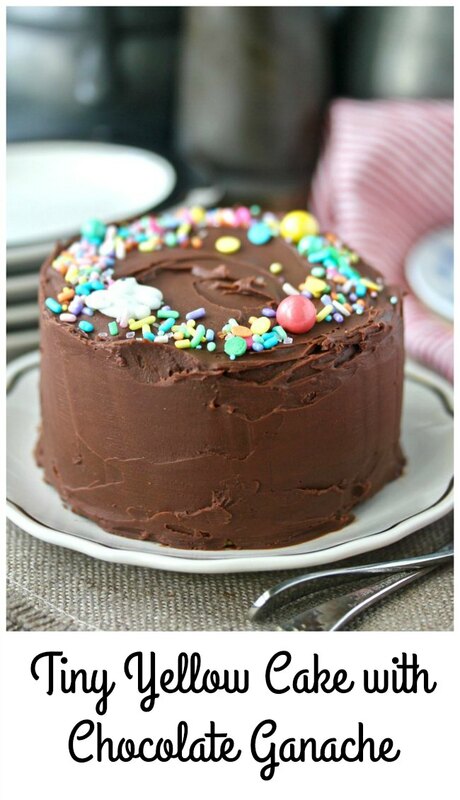 This tiny yellow cake with strawberry jam and chocolate ganache frosting is about the cutest cake ever. This is the last day for #SpringSweetsWeek, and your last chance to enter to win some pretty cool prizes. To learn more about the prizes, be sure to check them out on my post with these delicious key lime mini cheesecakes. Hurry up and enter today! I'm a big fan of tiny desserts. First, there are only two of us so I have to give away a lot of the baked desserts I make. Not that it's a problem. I have lots of willing taste testers. Second, I'm pretty bad at cake frosting and decorating. At least with tiny cakes, you have a little bit of control... sort of. The ganache frosting hardens up pretty fast, so work quickly. I actually made this tiny yellow cake as a gift for a dear friend, so I can't show you a "crumb shot," but, trust me, there is an actual cake in there. How Do You Make Tiny Cakes? First, you will need four inch cake pans. I bought these seven years ago when I made these gingerbread baby cakes. I have no regrets about buying the pans. I've made many tiny cakes with my grandsons using these pans, including this white chocolate birthday cake. It's so fun baking with my grand babies (now teenagers) and sending them home with a tiny cake! I have memories sewing (yes, I can sew!) with my grandmother that I'll never forget. Baking with these boys reminds me of those days. I used ingredients from three of our sponsors in this cake. I used whole milk Nancy's Yogurt in the cake and ganache. Nancy's Yogurt is probiotic and Nancy’s is believed to be the first yogurt in the United States to use probiotic L. acidophilus, all the way back in 1970. In addition, yogurt is a great substitution for sour cream or buttermilk in most recipes. Second, I sprinkled some Barlean's Flax, Chia, Coconut Energy Blend over the strawberry preserves in between the cake layers. I figured the seeds would mix well with the seedy strawberry preserves. Clearly, this cake is pretty much health food. 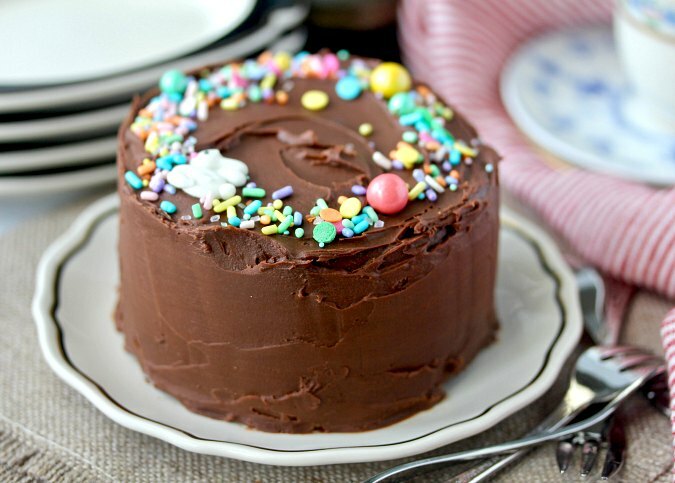 Third, I topped this cake with an Easter mix of sprinkles from Sprinkle Pop. Their mixes are fabulous. 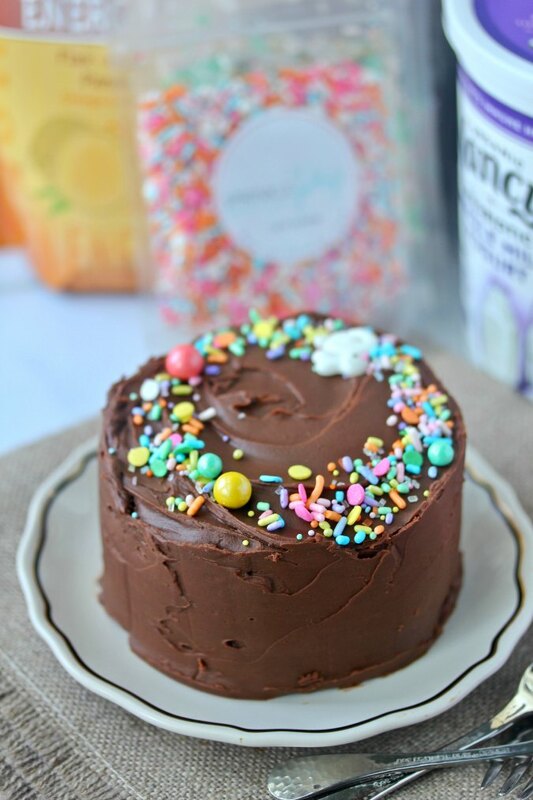 I love the different sizes of sprinkles (plus the occasional bunny!). You can make the cake layers in advance, wrap them in plastic wrap, and freeze them for up to 30 days, until you are ready to frost the cake. 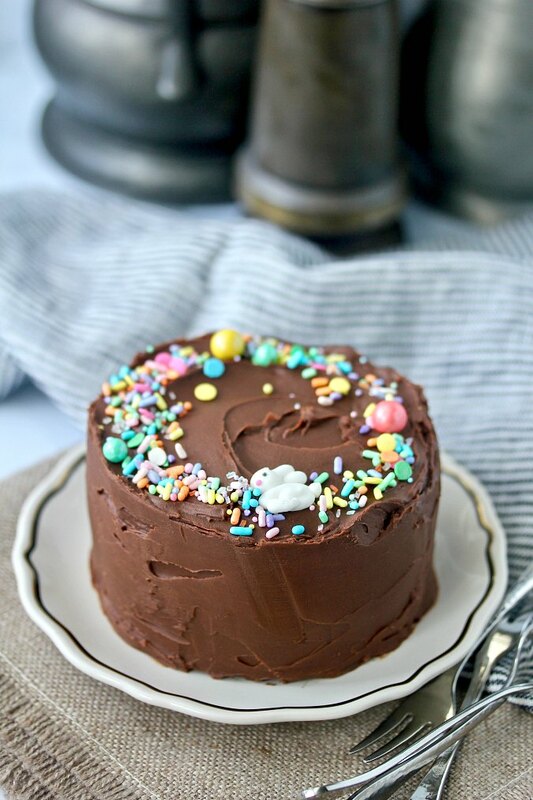 This cake is great for a romantic dinner for two. It's also awesome for birthday surprises. I love presenting these little tiny cakes to my family and friends on their birthdays or special occasions. The batter for this cake will seem kind of thick for cake batter. Don't worry, it will come out great and your cake will rise. Because this cake was a gift, I only tasted the cake tops that I shaved off to level the layers. I also tasted lots of spoonfuls of the ganache. Rest assured, what I tasted was delicious. Heat the oven to 350 degrees F and spray two four inch cake pans with spray oil. Line the bottoms with parchment paper and spray the parchment with with spray oil. Whisk together the yogurt and baking soda in a small bowl. Whisk in the egg yolk, vanilla, and butter. In a medium bowl, whisk together the flour, sugar, and salt. Add the yogurt mixture and stir until combined. Divide the dough evenly between the two prepared pans. Place the cake pans on a quarter or half sheet pan and place them in the oven. Bake for 25 minutes. Transfer the cake pans to a wire rack and let cool for 15 minutes. Turn the cakes out onto the wire rack, remove the parchment, and cool completely. When the cakes have cooled, slice off the domed tops. Wrap the cakes with plastic wrap and store in the refrigerator for up to two days, or in the freezer for up to a month. Place the chocolate in a microwave safe bowl. Microwave the chocolate at 50% power in 1 minute bursts, stirring in between, until the chocolate is completely melted and smooth. Let cool a bit and then stir in the yogurt, vanilla, and salt. Let sit until thick enough to frost the cake. Spread some of the ganache on one of the cake layers. Top with the strawberry jam and sprinkle with the optional seed mixture. Place the second layer on top of the first layer and frost the cake. This is so cute! I might just have to get those pans, too. And have to figure out how to make just enough better to fill them. Thanks Christie. I have no regrets after buying the pans! This is the perfect cake to share with your spouse! I love it! Thanks Heather! It would be good for an anniversary dinner, but without the bunny! This is just the cutest cake ever! and how can you say you are not good at frosting???? looks perfect! the phrase of the year, though: trust me, there is an actual cake in there. Awe thank you cake master! I'd love for it to be super smooth, but the ganache..... your molds would probably be fine, but I'm pretty sure your beautiful baking space in your basement could hold some 4 inch cake pans for tiny cake emergencies. =) I'm sure you'll put them to good use! I used to bake with my grandmother too - those are some of my favorite memories. I'm sure your grandchildren will cherish those memories of baking with you. Love the cake - I'm going to have to buy some of those teeny cake pans. It's great to be able to make a dessert without having loads of leftovers to eat or give away. Simit - Turkish Sesame "Bagels"